Lime deposits are a persistent problem in areas with hard water and are especially noticeable on chrome or stainless steel fixtures. Composed primarily of calcium and magnesium, hard water deposits are resistant to many commonly used cleaning products, although they are responsive to acidic solutions. Hard water deposits should be removed with an acidic cleaner as soon as they appear to prevent permanent staining. White vinegar is typically sold as a 5 percent solution of acetic acid, and works well for dissolving and removing hard water deposits from a variety of surfaces. Chrome faucets require more frequent cleaning in areas with hard water. Mix one part distilled white vinegar and one part clean water in a mop bucket or similar container. Soak paper towels in vinegar solution until thoroughly saturated. Protect any vulnerable areas of granite, slab or marble by covering them with cloth rags. Prolonged contact with acidic cleaners can damage stone counter surfaces. Remove saturated paper towels from vinegar solution and apply them to faucet, pressing to ensure contact in heavily soiled areas. Wrap all soiled areas of the faucet with paper towels and allow them to stand for one hour. Check paper towels periodically, and re-apply vinegar if dry. Remove the paper towels from the faucet, and scrub with an old toothbrush. Wipe hard water residue away with a clean rag, rinse well with water and buff dry with a cotton dishtowel or cleaning rag. 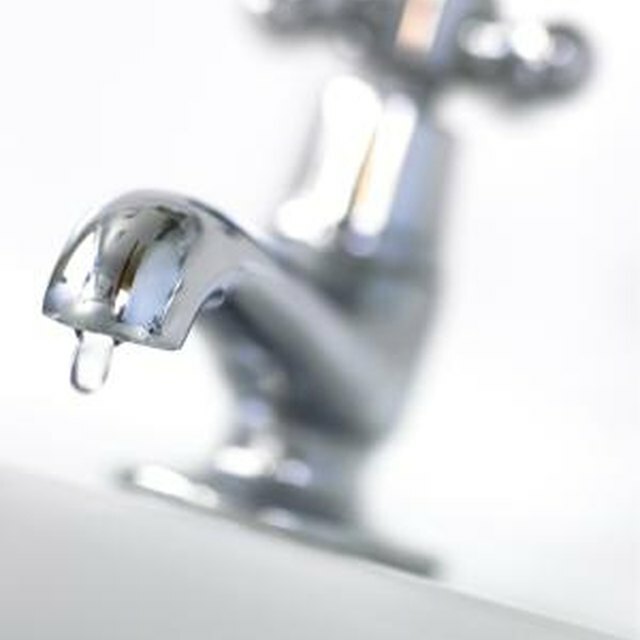 Clean aerators or other removable faucet parts by soaking in vinegar/water solution for one hour. Rinse clean.